Come play with us! Join Scott Crabtree, CEO of Happy Brain Science, on a journey through 100+ science-based solutions from our Choose Happiness @ Work card game! 100+ ways to thrive at work! We are social creatures, and solid scientific evidence suggests that even if you’re an introvert, your mood will go up with social contact with other people. Experiment with your own life. See what works for you. What the data suggests is that for most of us, most of the time, doing something with a friend will lead you to more happiness — therefore, more prime brain real estate coming online, so you and your friend do your best work yet. If you’re like me when I was during a certain skeptical point in my career, you might think, “Why would I be friends with people at work? I didn’t pick them to be my friends. They’re colleagues that randomly came into my life.” Well, like it or not, you spend more time with people at work than anyone else in your life if you have a typical schedule. So why not be friends with those colleagues? Gallup measures employee engagement with 12 statements that people agree or disagree with. One of those is: “I have a best friend at work.” A lot of people mocked that when Gallup came out with their Q12, but they came out with that because data suggests it drives engagement. 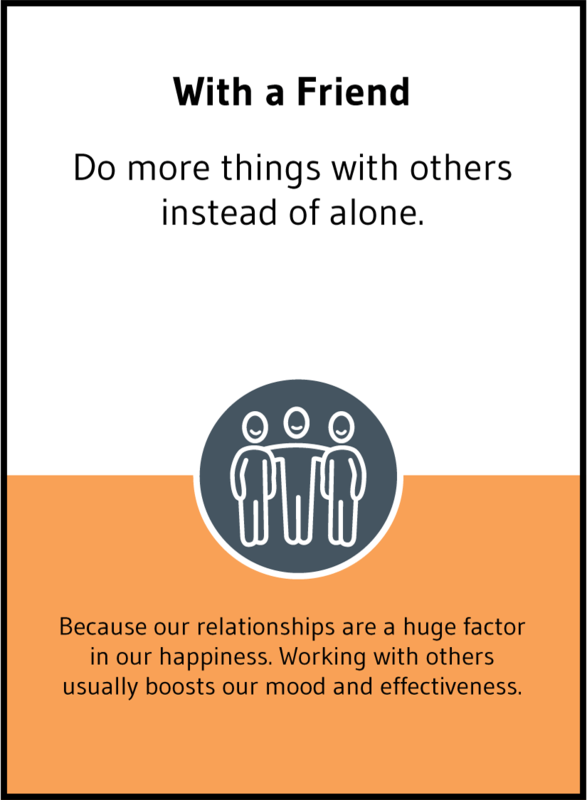 Having friends at work drives happiness and engagement, and therefore, success. So I hope you’ll do more with a friend. Thanks for choosing happiness with me. We’d love to know what you think! Are you friends with any of your colleagues? How do those friendships affect how engaged and effective you are at work? Please comment below! Want more great videos about how to be happier at work?